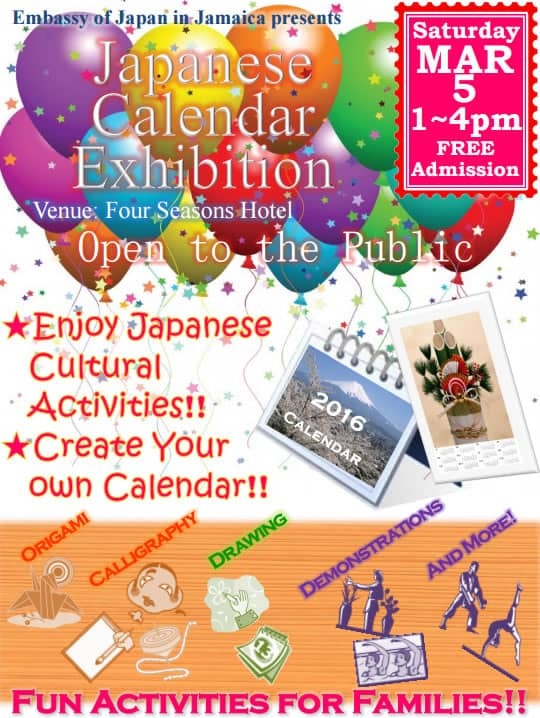 The last Japanese Calendar Exhibition I attended here in Jamaica was in January 2014 when there were celebrations to mark the 50th year of bilateral relations between Jamaica and Japan. Now in 2016, the exhibition will be held later than usual but is still expected to be fun for the whole family. Check out the flyer below. I will definitely be there especially for the other attractions such as origami and calligraphy. See you at the Four Season Hotel in Kingston come March 5th. Tweet me at @Jamaipanese if you will be attending. If you can’t attend no worries. look out for my follow-up post, with pictures and a recap.